yes, but that makes it difficult to be consistent with images on different boards if they react differently. I use a lot of scripts that work on all boards cause they work the same, but if they are now reacting different that means I have to watch out for things like this and it makes scripts and automations a lot harder. I'm having the following problem after upgrading this image to stretch. Then I replaced "jessie" in sources.list to "stretch"
and hangs for long time, I did not wait more than 10 minutes, though. can you show the complete output of apt-get update? I want to see where it stops "Hit 6" is not really a site or anything, just means it's the 6th site it tried to open, what ever the 6th would be. meveric wrote: can you show the complete output of apt-get update? Sorry, I have no possibility to copy-paste the output from U3 as it is the very minimal installation there. before it stalls in the square brackets it shortly prints "0% [Release.pgp]" or something like that, I'm not able to notice the exact string there, than it changes to "0% [Working]" and hangs forever. if you try to open: http://cdn-fastly.deb.debian.org/debian you'll see an error 404, this site does not exist and does not belong to the original sources of this image. Ok, I reinstalled everything and it seems to work now. Thanks! then it gives ~300 FPS. So, it looks like some problem with framebuffer drivers, perhaps? Any Idea how can I get more FPS for on-screen rendering? I don't much experience with Debian Stretch yet. As you may have noticed, this thread is called "Debian Jessie". My previous tests with Debian Stretch on ODROID U3 was not very promising, window movement on desktop was terrible slow and laggy, but I remember that glmark2-es2 was working "normal" even if somewhat slower than on Debian Jessie. You need a correct/updated version of armsoc driver to get this to work. I also don't know the state of your GPU drivers, since I don't know what you did to update the image and what drivers you installed. So it's really hard to tell what could be the issue. Yes, I have seen the other thread about stretch and that you had glmark2-es2 working at higher FPS than just 10, so this is why I'm asking. To update to stretch I just replaced "jessie" with "stretch" in the /etc/apt/sources.list. Also, I replaced "jessie" with "stretch" in /etc/apt/sources.list.d/meveric-jessie.list and also I removed "jessie-backports" from there as there seem to be no "stretch-backports". Then I installed "mali400-odroid" drivers. You write you installed mali400-odroid and the did the updates. That was probably the issue. Since the updates most likely have overwritten the mali libraries. Reinstalling the mali drivers might all that is needed. Last edited by igagis on Mon Jun 26, 2017 5:11 pm, edited 1 time in total. I'm currently working on the ODROID C2 version of Debian Stretch, and slowly check on all the other boards in time, but it's gonna take some time to figure everything out. meveric wrote: I'm currently working on the ODROID C2 version of Debian Stretch, and slowly check on all the other boards in time, but it's gonna take some time to figure everything out. Could you fix glmark2-es2 package? the packages you need are probably already available and you "only" need to set the correct version. This will show you all available version of both glmark2-es2 and the data files. You will see a line "Depends" which tells you what packages and version of a package is needed to install this package. The new package for glmark2-data comes from my port to the Debian Stretch image for ODROID C2. glmark2-data is an architecture independent package and for this is seen by both armhf and arm64, while I only compiled glmark2-es2 for arm64 up to now, since it was not available on arm64. Thanks, I could install glmak2-es2 now. Ich habe genau dieses Problem beim U3. Wie lässt sich das Problem da lösen? I have exactly this problem with the U3. das Bild oben ist von einem ODROID C1 aml_emmc gibt es NICHT beim U3. Dieser Fehler ist ODROID C1 spezifisch und kann daher gar nicht von einem U3 stammen. Vielleicht machst Du Dir doch einmal die Mühe den Fehler den Du tatsächlich hast hier zu posten. Im schlimmsten Fall musst Du Dir eine anderen SD Karte besorgen SanDisk Ultra (nicht Ultra Plus oder Extreme) laufen eigentlich überall. It's impossible to be from a U3, since aml_emmc does not exist on an ODROID U3, please post the error you really have instead of copying from an ODROID C1 thread. In worst case you have to use a different SD card, SanDisk Ultra (not Ultra Plus or Extreme) are most compatible. Das ist richtig. Ich habe das Bild nur Beispielhaft aus dem C1-Thread "rüber kopiert". Ich habe eine Speicherkarte Class 6, die funktioniert und eine SD Class 10. Die Class 10 bleibt beim booten genau nach dem Einlesen des Keyboard und Maus stehen. Da es bei dem C1-Image das Selbe war und das "runtertakten" geholfen hat, nahm ich an, das sich Das vergleichen lässt. Wenn es hilft, mach ich morgen mal einen Screenshot. DerekBuegel wrote: Da es bei dem C1-Image das Selbe war und das "runtertakten" geholfen hat, nahm ich an, das sich Das vergleichen lässt. Mit der Tastatur und Maus hatte das nichts zu tun und auch das runtertakten hat in den seltesten Fällen funktioniert, um genau zu sein ist mir kein einziger Fall bekannt wo es wirklich funktioniert hat. Beim U3 ist der SD port techisch eh auf max. 15MB/sec beschränkt, während am C1 viel schnellere Geschwindigkeiten möglich sind. Hier wird unter anderem auch UHS-1 unterstützt was beim U3 gar nicht funktioniert, daher gibt es hier auch unterschiedliche Taktfrequenze, welche es meines Wissens nach beim U3 gar nicht gibt. Der Fehler am C1 hat auch ganz andere Ursachen. Beim ersten boot am C1 funktioniert die SD Karte Fehlerfrei, beim ersten boot wird jedoch ein resize gemacht und aus irgendeinem Grund (Fehler im Protokoll, oder Hardware fehler beim SD Port) geht beim resizen der Partition was schief und anschließend hat die root-partition keine UUID mehr (gar keine) und da in der boot.ini vom C1 drinnen steht rootfs is auf partition mit UUID=..... bleibt das C1 an der Stelle dann hängen, weil er keine Partition mit dieser UUID mehr findet. WARUM dies passiert ist noch immer unklar. Ich habe mal den Screenshot gemach (ist nicht besonders gut gelungen). Es ist eine noname Class 10 4GB. hmm wie immer ist in diesen Bildern nichts zu sehen. Diese zeigen in den seltensten Fällen was das Problem ist. Sowas sieht man meistens nur wenn man ein UART verwendet. Man sieht zwar, dass mmc mehrfach runter getaktet wird von 40MHz runter auf 20MHz am Ende und das könnte tatsächlich ein Indiz dafür SD kart Inkompatibilität sein. Aber die eigentlichen Infos sind auf dem Bild nicht zu sehen. Die SanDisk sind auch so ziemlich die billigsten Karten die man findet. Ich kann nur empfehlen mal ne andere Karte zu testen.. alles andere wird vermutlich schwer rauszukriegen sein was es sein könnte. Mein Problem ist, das ich gerne auf 2 oder 4GB mein Grundsystem aufsetze und dann eine komplette (unkomprimierte) Sicherung mache. Basis ist eben Dein Jessie, weil es so schön einzurichten geht. Nur leider sind kleine Speicherkarten kaum noch zu finden und wenn deutlich teurer als 8GB. Es gibt verschiedene Arten Sicherungen zu machen.. das image hier is unkomprimiert auch nur ca. 500 MB groß und ich erstell das image dennoch auf einer 32 GB SD Karte. I'm still trying to get 3d acceleration work on U3 updated to stretch. I think DRI is not working. Question: where should this file come from? igagis wrote: I'm still trying to get 3d acceleration work on U3 updated to stretch. There is no dri driver for armsoc or ODROIDs in general, never was and who knows if there ever will be. That error can be ignored and does not affect 3D capabilities of the OS. Please share your entire /var/log/Xorg.0.log file so we can check if armsoc is initialized correctly. Also check on /dev/mali* if your user has access to the device. meveric wrote: Please share your entire /var/log/Xorg.0.log file so we can check if armsoc is initialized correctly. And my user is not in the "video" group. Although, I tried running glmark2-es as root and got same result, 9-10 FPS in each scene. Just to remind, as I already told, if I run "glmark2-es --off-screen" then I get 200-300 FPS for all scenes, but, of course, nothing is visible on screen. I really can't say what's the issue. I just turned on my image from a couple months back and it was working fine. You will find the download here: https://oph.mdrjr.net/meveric/images/Stretch/testing/ and it should be about 1GB in size when it's done. meveric wrote: I really can't say what's the issue. I just turned on my image from a couple months back and it was working fine. Thank you, I will try that image in the evening. meveric wrote: You will find the download here: https://oph.mdrjr.net/meveric/images/Stretch/testing/ and it should be about 1GB in size when it's done. Ok, I have tried your image and it gives better FPS, around 80 in most of the scenes of glmark2-es. But I could not find the difference between your image and mine. The only thing is that I use XFCE and you use MATE. But I don't think it can be a problem... or can it? Not sure the XFCE window manager had some issues in the past, at least under Ubuntu not sure how the current state is. try installing a different window manager and switch to that on your image to see if that can be the case. Maybe you have compositing activated? meveric wrote: Not sure the XFCE window manager had some issues in the past, at least under Ubuntu not sure how the current state is. No idea about compositing, how do I check it, or deactivate it? I will try installing MATE also. xorg.conf hasn't changed from Jessie to Stretch, so that should be fine. I don't really know where XFCE has it's config for compositing (I don't really like XFCE and don't use it for that matter), but I guess you should find info about this on google. meveric wrote: xorg.conf hasn't changed from Jessie to Stretch, so that should be fine. Hooray! That did it! I disabled compositing in XFCE4 and now I get 70 fps in most glmark2-es scenes! It was quite easy, could be done even from UI in Settings Manager -> Window Manager Tweaks -> Compositor. Just for info, I use XFCE because it works faster than all others, even faster than LXDE. Thank you very much for all the help! The solution appeared to be so easy, but that's how it always happens, spending days to find easy solution . Next thing is to make WiFi working, but I haven't bought WiFi dongle yet... so, later I might ask some questions about that also. after you helped me a lot with your GameStation project, again I have to ask you for help. I want to use my second Odroid U3 as a server for printers and external hard drives. For performance issues, I prefer to use it command line based without a desktop environment. Unfortunately, I have some problems to setup WiFi by terminal. Can you tell what to do to enable WiFi with your image, please? If you prefer, you may answer in German as well. I was just writing in English in case another guy not speaking German has the same problems and is looking for asolution. there should also be wpasupplicant installed, which offers quite some tools to manage WLANs as well. Also make sure you have the correct WLAN adapter. Normally it starts with wlan0 not wlan1 so make sure you have the correct adapter. Try ip addr show to see if you WLAN adapter is even listed at all. Thanks for the help. I installed wicd-curses. Thereby I was able to setup WiFi easily from terminal. I have connected emmc, sd, usb flash...and hub with external hdd. Sorry, I'm not sure why these issues happen, I've seen them occasionally as well, in different constellations. It's probably related with the extra devices you connect. Can you try again without using additional devices on SD or USB ports? You can also try if it makes a difference if you use "reboot" or "shutdown -r" for the reboot issue. I can't remove another devices because i have small emmc card, and i had move some sys folders to sd card. But most of the time this warning about power isnt showing, so i dont bother off it. Then I'm sorry I don't know what it could be. Maybe one of the logs can give some hints what happens during that time, or you can try using an UART to see what happens. 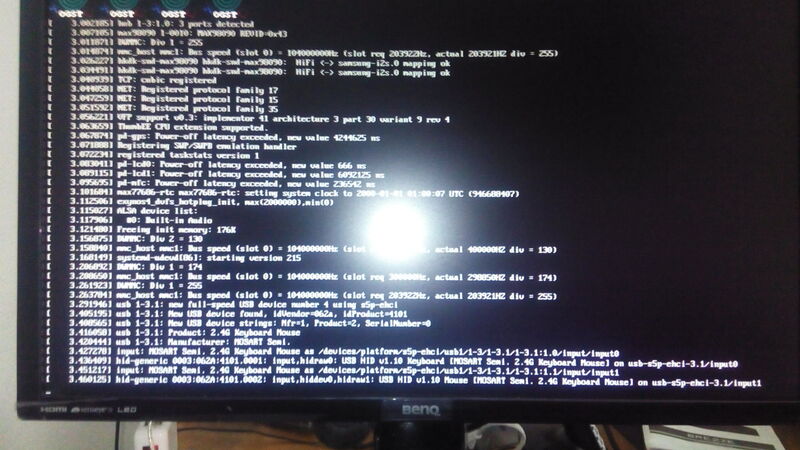 Re: [OS] Debian Jessie - disable tty in boot.scr? I' m using this Debian Jessie and all works fine! But...I want to use a reader like this ( http://wiki.volkszaehler.org/howto/simpler_ir_leser ) on the Odroid U3. I got it working on a Raspi and want to use it now on the U3. For that I thougt, I could use the UART-RXT-Line from ttySAC1 BUT this one is activated as default at bootup in the /boot/boot.scr-file. setenv bootargs "console=tty1 console=ttySAC1,115200n8 root=UUID=e139ce78-9841-40fe-8823-96a304a09859 rootwait ro  mem=2047M"
but it won't work - no booting anymore, 'til the file is originally restored. What looks strange, that the originalfile has special signs in it from the beginning in the first line. How to do it correctly? You have to use "mkimage" to generate a boot.scr file. 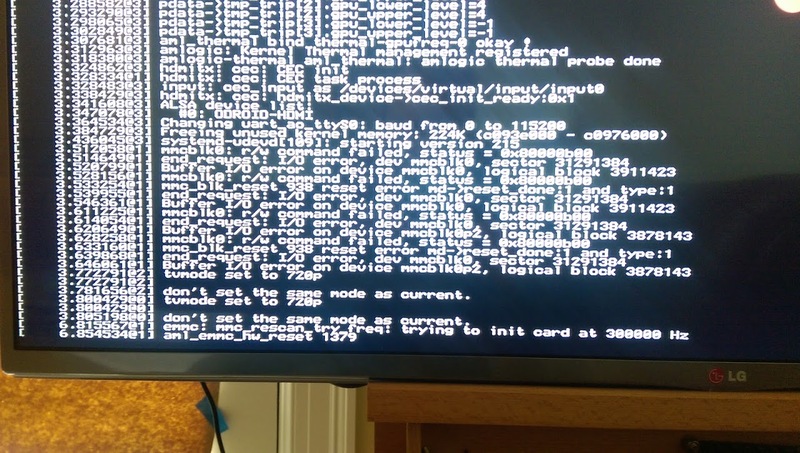 After a reboot, the odroid doesn't boot anymore. there should already be a boot.txt somewhere either in the .rar file or on the original image. You can't copy the .src and rename it .txt since it's a binary file. The .txt file is pure text... you can copy the text that is inside the .scr file and make a .txt out of it.. just leave all the scrambled characters out of it. I have an update problem. It hangs ( 0% [Working] ). Works when I disable meveric-all.list and meveric-jessie.list. What are the proper entries? The entries are fine and shouldn't cause any issue. Can you try using apt-get clean first and then do a apt-get update? Is this a new installation, or have you been using it for a while already? I installed it last month, mid of November.